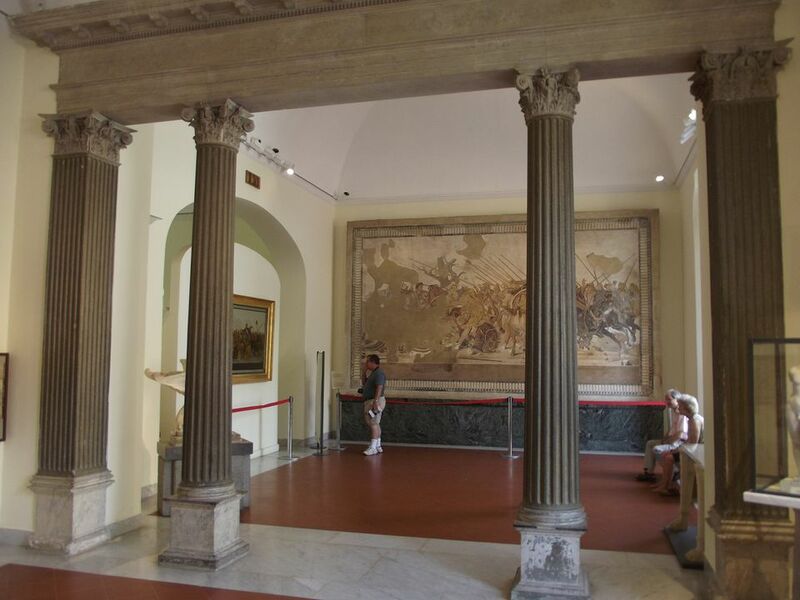 The Naples National Archaeological Museum, Museo Archeologico Nazionale di Napoli, is one of Italy's top archeology museums and a Naples must-see site. The museum, established by King Charles II in the late 18th century, has one of the world's best collections of Greek and Roman antiquities, including mosaics, sculptures, gems, glass and silver, and a collection of Roman erotica from Pompeii. Many of the objects come from excavations at Pompeii, Herculaneum, and nearby archaeological sites. Mosaics - Covering the period from two centuries BC until the eruption of Vesuvius in 79 AD, most of the mosaics are parts of floors or walls from Pompeii, Herculaneum, and Stabiae. many have figures from Greek paintings. The most well-known are the mosaics from the House of the Faun in Pompeii. Secret Cabinet - This room was created in the early 1800s to house the museum's many sexual items. It was closed for many years but reopened in 2000. Visitors must be at least 11 years old. Frescoes - Most of the frescoes come from walls in Pompeii. Covering a period of about two centuries, the frescoes are excellent examples of Roman painting. They cover a variety of themes, including mythological, landscapes, and scenes of daily life. Temple of Isis - A special exhibit holds wall paintings removed from the temple of Isis in Pompeii as well as artifacts from the temple. Pompeii Model - Made in the 19th century, the model of Pompeii is very detailed and helps the visitor visualize what it looked like before the eruption. Sculptures - The museum has a huge collection of Greek and Roman sculptures, many of them are Greek and Roman. Coins and Metals - Six rooms containing more than 200,000 coins and medals from Ancient Greece, Rome, medieval times, and the Bourbon era. Prehistory and Early History - These rooms cover objects related to the Bay of Naples from paleolithic times to Greek colonization in the 8th century BC. There's a section on the Etruscan occupation of the area. Metro station: Museo. No parking available. Cumulative ticket (valid for 3 days) includes the museum and Campi Flegrei archaeology sites and museums. Save on admission with the Naples or Campania Artecard. It can be bought ahead or right at the museum.